Near or Far: Do the Benefits of Living Closer to Work Outweigh the Cons? 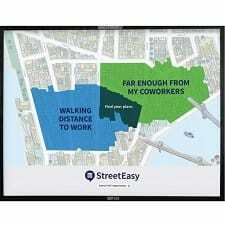 There’s an amusing Streeteasy ad campaign in a lot of NYC subway stations right now, with Venn(ish) diagrams like this one, and I thought it might make for an interesting discussion here. Why did you choose to live where you do? What do you think the benefits of living closer to work are — vs. farther away? Do you prefer to have some separation between work and home? In general, what was the most important factor for you in choosing where to live — living closer to work, being in a good school district, having an amazing apartment, or something else? We’ve talked before about how where you choose to live can be one of the most important money decisions you make, as well as how to decorate your home and even when to buy a home, but we haven’t really talked about the pro and cons of living closer to work or farther from work. The most surprising thing I learned was that I absolutely HATED everything about the work-life balance that came with the apartment. The commute that had looked amazing on paper — there was a subway entrance across from the apartment, and it was only one stop away from the office — meant that I didn’t “see” anything while I was going to and from the apartment. I didn’t pass stores or restaurants on foot on either side of the subway, and I was really surprised by how much I missed that casual, window-shopper type of experience. Plus, I’ve always hated the subway and at the time spent way too much of my budget on taxis to work — but on nice nights, if I got out early enough I had loved walking home. Both of those options were difficult in my new location. I had to go out of my way by several blocks to find a cab if I wanted to get to work, so the subway really was easier. If I walked home on nice nights, I had to cross the tourist-filled Brooklyn Bridge, and once again I wasn’t passing any shops or restaurants. Even on the weekends, I was surprised by how much my apartment depressed me because it was in such a residential area. I felt that “just popping out” for food, shopping, a walk, or whatnot was much more depressing. What do you think, readers? Do you prefer living close to or far from work? 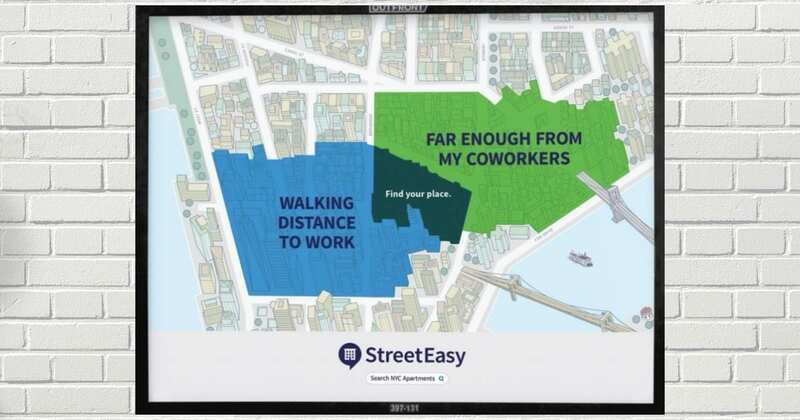 Do you see more disadvantages or advantages to living closer to work? My commute is 15-25 minutes by car, depending on traffic, or 30 by bike when the weather cooperates. I pay significantly more in housing costs than I would for a longer commute. At least some of that is counterbalanced by cheaper commuting costs (gas adds up), but not that much really. It still costs me a lot. It’s absolutely worth it to me. My time is valuable to me. Exact same here! Plus it’s nice knowing that if I need to run home for something at lunch, I easily can. Every.Single.Thing. in my life is based on distance. Thinking about moving kids to a gifted kid middle school not b/c it is better, but b/c it is closer to my job / our house. YES. This. I used to spend 3+ hours commuting every day and was miserable. Now I live 10 minutes from work and love it. This region is generally LCOL, but I pay realatively high property taxes in order to be close to downtown. My coworkers have 30+ minute commutes so they can live in the ‘burbs where houses are bigger and taxes are lower. I just don’t understand that tradeoff. For me, the tradeoff of a 30-40 minute drive v. living closer to my work means I can afford both a mortgage payment AND groceries. Even if I lived close enough to not need a car, the amount I spend on my vehicle would not come anywhere close to covering the cost difference between the rural location I am in and housing downtown. Real estate prices are becoming insane in my mid-sized midwest city, particularly considering the average salaries have not shot up the way housing costs have. For me, the tradeoff is better schools in our suburb. If I didn’t have kids, I would live in a loft downtown and walk to work. But I want my kids to go to excellent public schools, and that is not the case for the schools in the district where I work. So I live 30 minutes out and commute. Bonus is a bigger house, but schools are the driving factor for us. I don’t have kids but I keep an eye on housing costs in areas that would be an ideal commute. I live 20 minutes from my office which is the perfect commute, but I do need to travel to clients all over the Chicago suburbs – up to 1hr 15 min driving. But given that my clients are spread out everywhere, even an hour is reasonable compared to what some of my coworkers endure. I moved to suburbs to move in with my fiance. The next time we move/buy, we’ll definitely seek a compromise when it comes to our respective commutes, which is another issue. I could have a 20 min commute but his can be up to an hour. I too live within a 30 minute car trip to work. I would love not to have to spend the time in transit, but the only alternative would be to live in town, and my firm’s office in town is not an ideal location to be walking around after dark. So all-in-all, I get in my car at the end of the day at our underground lot, lock the doors, and drive home through a number of seedy neighborhoods before I get to my own, which is still a nice place to live. If I ever switch jobs, and move to another town, I will think about living closer, but for now, what I have will have to do! – all of our closest friends live within 1.5 miles in either our neighborhood or another inner ring neighborhood. – I suppose in theory we could walk to work, but I never have, so this didn’t factor into our conserdation at all. The cons are probably that we pay a lot for housing for the area as a whole (but we’re at the low end for our zip code). We could easily find something another few miles out where we’d pay less. But, it would add to the commute. Another con is that we don’t live in a giant newly built house (ours is 2500 sq. ft.) and was built in 1919, so parts of it are 99 years old and have the problems that a 99 year old structure has. There’s also no room for the house to “grow”. We’re planning on maybe having one kid, not more. But if twins suddenly were in the picture, we’d likely have to move. I live in a midsized city with a serious case of white flight. We live in the city because I do not want to arrive to work frustrated because of traffic, nor do I want to get up an extra hour early to drive into the city. My current commute is about 15 minutes by car, and that is only because there is a distinct lack of merging ability in my city, so the interstate can be really slow. I also have about a 5-10 minute walk (depending on the lights) from my parking deck to my office. I’m lucky that my husband agrees that the positives of living in the city outweigh the negatives. I spent a year fighting the horrible Austin traffic, so when I moved to Houston, I bought the cutest house close to downtown that I could find (Montrose, for those other Houstonians – I love my neighborhood). It was the best decision ever, and I am never moving. However, we lucked into a great neighborhood school, which we weren’t even considering at the time because we expected this to be a starter house. Now that I have kids and a busy job, my short commute (seven minutes) is what makes my life function. I live on the westside, and work on the westside – less than 10 min commute. I am a biglaw attorney now but interested in taking a gov job (have a few interviews), and they are all downtown. How is it really to commute from westside to downtown? Whether I am willing to do that is proving to be more of a quandry to me than the pay cut. I am not someone who wants to be far from work (closer the better), but am willing to think about it for a good opportunity for a more long term position. I have no idea on the commute, but at least in DC many government workers get to work from home 2 days a week. It might be worth exploring if that would be an option, cause it can make a significant difference in how horrible a long commute is. I think it depends how close you are to the 10, and how close your office in downtown is to any of the freeways. I live about 5-10 minutes from a 10 west on-ramp, so it isn’t that rough to get to downtown in the mornings. But if you had to thread through a tricky part of downtown, that might add quite a bit to your commute. My commute felt a lot worse when I routinely had to spend 15-25 minutes getting down one of the big north-south streets TO the freeway. Also if you have the ability to use the Metro, that would be ideal (it might take longer but you wouldn’t be driving). While online services are notoriously bad at this, I just did a G oogle map search between my house and my office with the “arriving by” set to 8:30 am. The time it gave seemed pretty accurate to me. Another thing to consider is that going home might be faster, or at least less irritating, if you take surface streets out of downtown LA (e.g., going west on Venice or Washington instead of even bothering to get on the 110) and switching to the 10 if Waze thinks that is better. Thanks for the comments. I was planning to ask about WFH options if can get an offer, and I am indeed close to the 10. I am also close to the Expo line, and office would be near Union Station, so that could work. Oh totally take the train then! At least some of the time. Do you have to live on the westside? I bought a condo on the westside and then switched to a firm in downtown a few years later. My 12 mile commute was at least 45 minutes, sometimes up to an hour, each way, on the 10 and the 110 freeways. If you need to get on the 405 at all, don’t even think about it! And that’s when I started going in at around 7:30 to workout before work and never left downtown until about 7:30 or so, so I shudder to consider rush hour traffic. Can you move closer to downtown? This. It can take an hour or longer in bumper to bumper traffic on the 10 in the morning (this is based on Brentwood to downtown). NEVER AGAIN would I do that commute. This is totally fair, but I would rather not take the job than leave the west LA. My whole life is here. My husband has a commute in the opposite direction that is about 30-45 minutes, so any time savings I would get by moving closer would just put him in the car longer. My gov job doesn’t allow for regular WFH, so keep in mind it is very agency specific. I would also ask what the tour of duty hours are and what the typical work hours are. 8:30-5 would be brutal by car, at least when I lived on the west side. But if you can get in earlier or later, it is doable — I never left my downtown job before 6:30 to go home to Santa Monica, and since I often left significantly later than that, it was 25 min home. But leaving between 8 and 9am, even just a few blocks from the 10, meant 65 minutes minimum to my office. Having some flexibility in hours is pretty important. This. Timing is everything. My 8 minute drive was suddenly 40 if I left the house after 6:15am. If your hours are flexible, do it. In my (also gov’t) office civilian employees can choose when to come in the morning as long as they stay for an 8 hr workday – BUT if the boss comes in later they can get stuck working on an assignment with him. I’d recommend reaching out to current employees to get a feel for hours in your office. I currently live downtown in a mid size city. I work just outside the city, so my commute is 30 minutes with little to no traffic. My commute is pretty ideal as I have lots of friends with worse traffic and longer commutes. I’m moving at the end of June to the town where my job is. I’ll be 10 minutes from work, tops, and still 20 minutes from the city for when I want to go out. I live on the East side and work on the East Side (about 2 miles walk). Now dad wants me to move to the West side and work on the East side, which is about the same distance, he says, but not direct, and I would have to take a bus cross town, then a subway downtown, unless I walk. I am concerned that walking cross town at night may be dangerous, but Dad says nonsense. Fine for him, but I think the West side is a little questionable to me, and there are some projects nearby that I think I would NOT like walking near, or through. Dad says I will be living in a 5 star condo with 3 br, 3 baths, a maids room and a wrap around balcony. I told him I did NOT want to move, but he insists b/c he will be teaching at Colombia U which is a simple ride uptown for him. I think he is being selfish, but since he pays for everything, I really do NOT have much choice. The only thing in my favor is that the condo is selling very slowly, so they have NOT even broken ground yet! I am hopeing that Dad will loose interest, and even though he has put down a 20% deposit, he says it is refundable if they do NOT break ground by year-end! I secretley hope they don’t b/c I LOVE being on E 77th street, even though there are unemployed bums that hang out on 3rd avenue and yell out obsenities at me when I walk by. FOOEY on them! FOOEY! About a year ago I moved from an area that was very lovely but a longer commute (bus + Tube, 45 minutes if the stars aligned, usually an hour or so, 1 hr 30 on a bad day) to living very centrally, 30 minutes walking distance from work. The bus or tube take about the same amount of time because walks to the stops/traffic. 30 mins may still seem long but the ‘normal’ commute here is about an hour, nobody drives, and many people commute to the city from outlying towns and it takes them ages. Pros: I love that getting to work is in my control, not on a stressfully busy and sweaty tube, and the walk can be a nice decompression at the end of the day. I like that I can do a ten hour day and still be home before seven (for some reason getting home after seven makes me feel like I worked Really Late) and feel like I’ve had a proper evening and a rest. This has meant I’ve taken up a new creative hobby I’m really enjoying. The cons: I also chose to live alone and it’s very expensive (it’s a nice flat, but not well-finished, and I’m paying rent instead of seriously saving for my own place). A lot of my weekends take place in the same area as where I work, or at least a lot of the walk is the same, so my life can feel a bit small. I’m in Dallas where’s it’s so spread out and you have to drive, so right now I’m interviewing and googling before I apply so I make sure the commute is acceptable. Also if you are going to commute it should be somewhere you don’t mind running errands at lunch, and a part of town where you won’t be afraid to drive after dark. Time is more valuable than money to me. I work crazy hours in the hospital, and minimizing commute was probably my most important factor in choosing where to live. Walking distance. Short walking distance. In Chicago – I leave the hospital skyscrapers, then cross a street and walk through a small park. My stress level immediately falls. Then I look to my right and see a lake as big as an ocean. And I know I am almost home. It wasn’t more expensive than if I lived in other nearby popular areas. But I spent a long time looking for the perfect place, and I pounced when it became available. A few years ago, we moved so I could live closer to my office. My short commute is sometimes the best part of my job. I try not to drive any farther than I have to, because traffic drives (punny) me crazy. Kat – I am confused. Moving to Brooklyn was moving closer to your Biglaw office? I understand how this could be possible, but the post reads like you discovered you didn’t like living closer to work after you moved to Brooklyn, which SEEMS like it would be further from your office. But I am not a New Yorker, so if I am missing something, please let me know. I think she worked near Wall Street. Clark Street is in Brooklyn Heights immediately across the River from lower Manhattan and the first stop on the 2/3 train in Brooklyn. If she lived uptown in Manhattan before, she could easily be closer to her office in Brooklyn Heights. Agree. I’m in NJ and would only consider financial district firms. Then we merged with a midtown firm (Midtown East). I’m all “OMG time to move firms b/c this commute will not work”. Financial district is also close to Brooklyn (vs midtown). I have friends who had jobs move from midtown to Stanford — yikes. Currently thinking about this a lot. I have a somewhat ideal commute – walking takes 15 minutes, driving 5 – and kiddo’s school is in between. 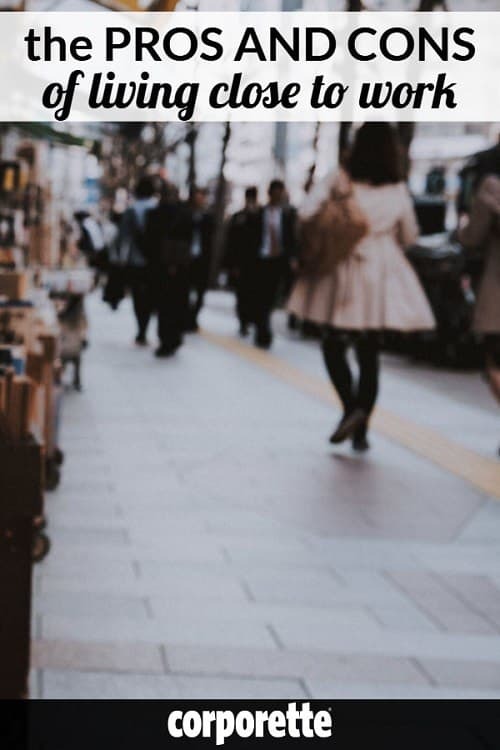 But there has been a tradeoff with not having more of an off switch between being at work or at home, as there is almost no transition time, and there is no stopping off to run errands or window shop. I have no desire for a long commute, but sometimes wonder if something in the 20-30 minute range would offer more of a buffer between work and home life. I also read somewhere that all errands should take place within the triangle formed between work, school (if kiddos are in the picture), and home, but if there’s no real space between those three things, then we have to go outside the triangle to do those things,and I’m often surprised and disheartened at how weekends can get eaten up by running errands. 1. Tie on the errand on a trip you are already taking. Otherwise, errands will eat the weekend. 2. Moving –> driving more –> more acute stress / Mom Time Logistics Traffic Nightmare stress; this is not a good trade when maybe errand consolidation can be (like order groceries online and pickup when you are coming back from swim lessons, etc.). 3. Many moms with afternoon driving nannies have the nanny do a grocery run (esp. if groceries are pre-ordered). I would totally do this. 4. Three words: Target red card. They will ship stuff to your door (hello, emergency dishwasher pellet delivery). I’m curious about this too. I might be moving to our home office and have looked at apartments right across the street from work which seems so tempting – especially if I’m working longer hours. But I’m worried that I’ll always feel like I’m at work without the physical distance between work and home. I have about a 35 minute walk to work/15 minute bike ride to work. I can take the metro/bus, but those also take about 35 minutes. At my last job, I had a 20 minute metro ride. 35 min is about as long of a commute as I want. Given that I knew I would be changing jobs at some point after buying and that I wanted to stay in DC, my house search was driven mainly by cost. There are just huge parts of the city I can’t afford. I plan to stay in my current home until I have kids who are elementary school age, at which point I will have to move unless I luck in to a good charter/OOB option. Unless my in-bounds school gets substantially better over the next 4-5 years, it’s not an option. I work in one of the most expensive parts of town, which is way outside our budget, so I knew I’d have a commute. It is absolutely the worst thing about my life. But we can’t afford to move to any neighborhood that would be better (and convenient for DH’s job) so here we are. On the flip side, we love our house, the neighborhood is great, we love LO’s daycare, the schools are supposed to be good, we’ve made friends, so it it works. To the sewing-hobby poster from this morning – this is going to sound wacky, but have you considered making doll clothes? I’ve been to a zillion craft show local artisan type events, and the prices that you can fetch for fancy doll clothes are insane (to me). Might be a fun way to keep up your hobby and design tiny little dresses without having to worry about 1) real human measurements, and 2) making things you can’t wear yourself. Just a thought! This is a great idea. My grandmother made my Barbie’s clothes and they were such nice fabrics and tailoring. I still have them and I’m 50. I commuted an hour each way in Michigan when my son was young, and never again. Snow, tornado warnings, construction + the usual childhood emergencies/scheduling conflicts, etc. was really, really stressful, even though my husband could handle most of it as the parent on site (but only because he was teaching faculty at university). When I stopped commuting, I couldn’t believe how much time I had for being with my family, cooking, working out, running errands intermittently instead of stacking everything up on the weekends…. I now have about a 15 minute commute on surface streets, and I can bike to work on days when I don’t have meetings. My dream would be a 20-30 minute walk to work with option to drive in bad weather. Sorry, didn’t mean to nest this! San Francisco Bay Area — so housing costs are insane & traffic has been getting worse & worse every year, most every commute is awful, it’s just a matter of degrees. If you’re under an hour to work (by car or pubtrans or company shuttle), you’re doing great! I walk two miles each way every day, and I love it. My husband and I recently bought a house, and our realtor seemed irritated by the fact that we wouldn’t look at any houses outside of a two mile radius so that I could keep my commute. I used to drive seven miles across town for work, which was 20 minutes on a good day and occasionally 45-60 minutes on a terrible one. Keeping my work close to home and being able to forgo the expenses (gas, mileage, parking pass) of a car commute is very important to me. I live two miles from my job in my city, and it’s a 40 minute walk, a 15 minute bus ride, or a 20 minute bike commute. However, my husband commutes 90 minutes each way to his job in the far suburbs. It’s not a great situation for him, but we’re both committed to living in the city. Needless to say, he’s looking for work either from home or in the same city. I live 35-40 min commute door to door in NOVA (5 min walk to metro, 25-30 min metro ride, walking to work building/up elevator). It’s pretty good and honestly we can’t afford to live in a good neighborhood any closer DC. So if you’re in a HCOL city, I think that living close to work can really be a privilege for the wealthy and not an option for a lot of other people. When I first moved to my very large NE city, I lived about a 2 minute walk to work. Turns out I didn’t like it. When I got home from work, I was still in work mode. Now my commute is 5 minute drive to train, 25 minute train ride, 5 minute walk from train station to office. I love it. I think a big plus is that I take the train, and I read on it. It’s my quiet, decompressing time and it’s one of my favorite parts of the day. By the time I get home I’m definitely in home mode and not still stressed from work. 25 minutes in the car would be a lot less enjoyable for me I think. I spent three years doing a 100+ mile commute every day, and there is nothing better in this world than a short commute. My current one is two miles, about half a mile of which I walk. It has improved my life more than I can say. I have evenings again!! My husband and I bought our house in the city about a decade ago in our LCOL city. We were a 30 minute door-to-door commute by bus from our adorable Victorian neighborhood (walking distance to grocery stores, restaurants, bars, etc.) to our downtown jobs. When we both worked downtown, this was absolutely the greatest – a short (less than .5 mile) walk to the bus stop, a 10 minute bus ride, and then a very short (a couple of blocks) walk to the office — just enough separation without being at all stressful. Five years ago I took an in-house gig in suburbia on the opposite side of the city. It’s 30 min with no traffic, but can be longer than an hour in rush hour (especially when it is raining — no one here can drive in the rain). On an average day it’s 50 minutes each way. Waze has been a huge help, but the commute is still slowly sucking the life out of me, and it feels like I don’t have much more time at home during the week, even with my improved post-biglaw work/life balance. I love my house and my neighborhood…. but if I was definitely going to stay at this job for the long haul, we would eventually have to move. The difference between a stress-free 30 minutes (I usually read or listened to music — good decompression time) and a bumper to bumper 50 minutes each way is insane. Not to mention the weight that I immediately put on by no longer doing that (short!) walk as part of my daily routine on top of my dedicated exercise. I’m in my situation because I bought a house and then later took a job with a bad commute — I cannot fathom moving to this kind of commute intentionally. For the past 18 months I’d been living in a cute errand-friendly neighbourhood close to downtown and commuting 25 minutes out to the countryside for work. While browsing for apartments a few weeks ago, I found a room 5 minutes from work and jumped on it. My commute wasn’t crazy before but I am IN LOVE with it now. I try to bike at least once a week and I’m already feeling stronger. If I bike, my mind completely disengages from work mode. If I drive, I risk still being in work mode but the beauty of the countryside and the novelty of a new place is still distracting. A few years ago, I took a contract that required me to commute an hour on public transit and I got back into reading library books as a result from it. I hated the job but the commute was lovely! My commute is about an hour each way during the school year and maybe 5-10 minutes less in summer. Because I am only required to be the office 2 days per week, I frequently work from home, and my commute does not bother me that much — except for the day I forgot my laptop at home! What a nightmare. My husbands commute is also long and in the opposite direction. Moving closer to work is not an option. My husband and I are DINKs, and so we are okay with the current situation. We save a ton of money on housing and property taxes this way, too! I used to have a 15 walking commute for 5 years, and loved it. I worked in BigLaw and knowing that I would be home in a few minutes was huge. And I loved the walk, even in frigid weather. Now I live in DC and have a 35 minute commute — short walk and then hop on the metro. I vastly prefer the metro to driving but I definitely miss walking to work. My ideal would be a 1 mile walk to work, each way. Good exercise and a great way to start the day. In my case I prefer for my home to be close to work. After years of having an hour and a half each way, commute I learned to appreciate that living close work is a luxury. I chose my current home as its 4 streets down from where I grew up. I’m a young lawyer and work in a midsized Midwestern city. Alot of the lawyers in my class live downtown in beautiful apartments, but I need separation from work. We recently bought a house on acreage with a 25 minute commute to work. Like someone else mentioned, the day I forgot my laptop was the worst, but overall I love it. I love how home is an oasis from my high stress job. And best of all I love feeling safe all hours of the day, unlike when I lived in the city. I am working in the city center, fortunately right at a underground station. I am still living at home in an outer district of the city, but in walking distance of an underground station. I need about 30-35 minutes oneway to work and that is the maximum I want to endure. It might be less stressful if I didn’t have to change trains and therefore could use the time more effectivly for reading. When I get my first own appartment I will check not only my daily commute, but also other places I am at regularly so I at least don’t spend more time commuting than I do know. Unfortunately appartments in a more central district are way more expensive and if you don’t live directly at an underground station commuting will take at least the same amount as it does now.